Home » Politics » Trinamool Congress now a national party. 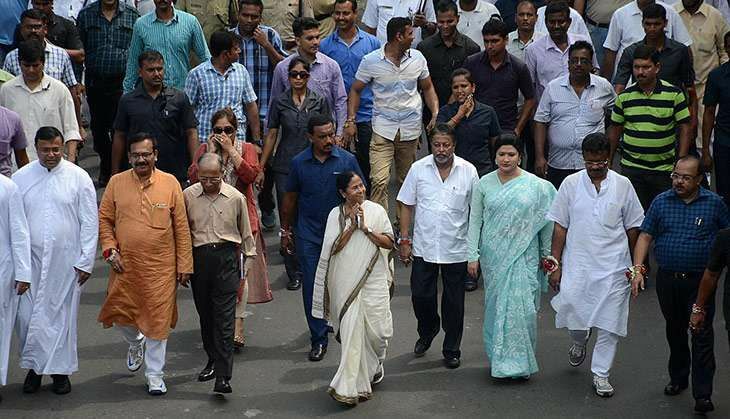 What's next for Mamata Banerjee & Co.? Election Commission makes Trinamool India's seventh 'national party'. What's next for Mamata & Co.? The Trinamool Congress was recently declared a 'national party' by the Election Commission of India. And now, the West Bengal unit of the party has decided to give more responsibilities to its senior ministers, including party supremo Mamata Banerjee's nephew Abhishek Banerjee. The party's key target is now to increase its reach to people across the country. Tapas Roy, deputy chief whip of the TMC, confirmed that Banerjee would convene the meeting once she got back to Kolkata. "After that, we'll decided on what we need to focus, so that we can reach people on a pan-India basis," he said. Banerjee herself had tweeted her elation at the development: "Landed in Rome and got a great news. Trianmool gets a national party status. We started in Bengal 18 years ago and now being blessed by people across India." What makes a national party? India now has seven recognised national parties - the Congress, the Bharatiya Janata Party, the Bahujan Samaj Party, the Communist Party of India, the Communist Party of India (Marxist), the Nationalist Congress Party, and now the Trinamool Congress. So, what is the criteria for a party to gain 'national' status? - Or, it has been recognised as a 'state party' in at least four states. The Election Commission has already said that the Trinamool Congress satisfies one of the conditions mentioned in the Election Symbols (Reservation and Allotment) Order, 1968, to be recognised as a national party - it is a recognised state party in West Bengal, Manipur, Tripura and Arunachal Pradesh. The Election Commission had, on 22 August 2016, amended a rule, whereby it will now review the national and state party statuses of parties every 10 years instead of the erstwhile five. Had the rule not been amended, Trinamool Congress would not have been recognised as a national party, as it had not performed well in the Arunachal Pradesh Assembly polls, and would have lost state party status there. The amendment in the rule had also come as a major reprieve for the BSP, the NCP and the CPI, as they were facing the prospect of losing their national party statuses after their dismal performances in the 2014 Lok Sabha elections. The EC had served them notices in 2014 on the issue. While Mukul Roy, the all-India vice president of the Trinamool Congress, has already been given charge of the Northeastern states, especially Tripura, to strengthen the party's base, the future now hinges on Banerjee's upcoming meeting with her ministers. A senior TMC minister told Catch: "The key ideology of our party, 'Ma, Mati, Manush' (Mother, Motherland and People), will remain constant. We need to look how we can garner support from all over India through our ideology. We need to look at the geography of each state and the political situation of each state before setting up base in that state." Another senior minister said: "Apart from strengthening the TMC's base in a particular state, our main focus will be to look at the development aspects that need to be taken care of in each state, and also include beneficiaries in various projects, so that they are entitled to receive the benefits." It was also decided that zonal party offices would be set up in every state, and local leaders from each state will be screened and finalised only after getting the final nod from Banerjee herself. READ NEXT >> Why did China fail to roll out red carpet for Barack Obama at G20?